PETROF presents the very top model made in its workshops. The ANT. PETROF 275 is brand new concert grand piano. 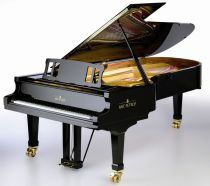 The flagship designed for the big concert halls and to fulfill the demands of todays best pianists. Traditional family brand ANT. PETROF was chosen for this flagship. Antonin Petrof, founder of the company, used this abbreviation on his first grand pianos and now, after 150 years, the brand is reborn. Nothing but top quality is allowed in this new grand from PETROF. It aims to the highest posts, the concert halls and most demanding players. ANT. PETROF 275 grand piano is result of 5 years of development and research in PETROF R&D department. The whole construction is designed from scratch. 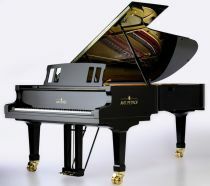 Over 50 innovations are used in the construction of the piano, 2 of them were patented. Only 1st class materials of European origin are used in this instrument. More than 75 % of the operations are made manually and all the operations are made with the great care. And of course it is 100 % made in PETROF factory in Hradec Králové, Czech Republic. Explore the ANT. PETROF brand at www.antpetrof.com.